Do you know, nature and the world around me continues to amaze me on a regular basis. After months of waiting we finally got underway with lambing this week. As I write we have two lambs born, one male and one female and another nine ewes yet to give birth. From the size of some of them, twins are on the way. 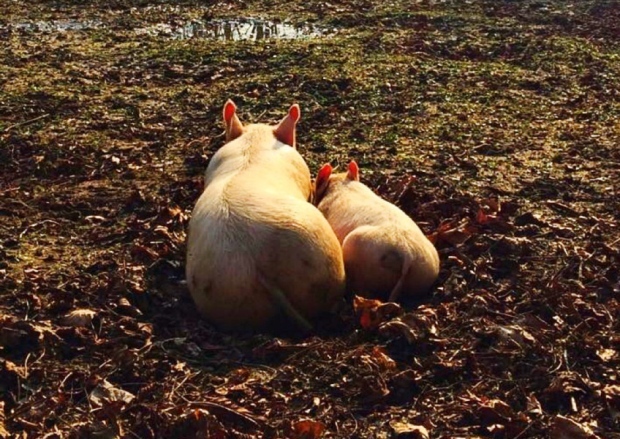 Precious and Petal enjoy the sunshine. These newly born lambs, within minutes of coming into this world, are up on their feet and only 24 hours afterwards they are not only trotting along after their mothers in the field, but they are leaping and frolicking around like any good lamb should. I just can’t get my head around how these things can happen so quickly. We are so lucky to be able to witness all of this going on around us. I made a major discovery this week with regards to the behaviour of many of our animals. Without really considering it before, I have, without thinking about it witnessed this discovery in action previously, but this week the penny dropped. 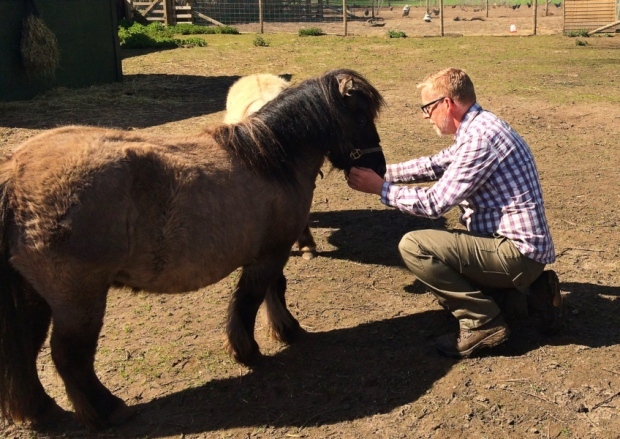 Now I’m not the biggest fella on the block but to some of these animals, I suppose I could appear ‘big and scary’ as I walk towards them to pet them, but what has become apparent is that if I squat down to their level, they react in a much more positive way. The pigs come up and get a stroke, the goats come for a nosey, the hens think you have something for them, the sheep arrive en masse for a tickle under the chin and the cattle come for a back scratch and a cuddle and it seems it is all because you get down to their level. This realisation happened when I noticed with the ponies that when Lucy was having one of her strops and wouldn’t come out of the field to get moved, all the talking and cajoling in the world wasn’t going to get her shifted. Exasperated at my lack of success, I squatted down in the dirt and when I looked up, there she was inches away, with her big eyes looking into mine. Maybe stupidly, I let them both go for a further run around to test the method again and lo and behold, it worked and has done ever since. We had a further three weaners arrive on Sunday, they are Gloucester Old Spot X Pietrain gilts and we weren’t sure how they would settle in with Petal and Precious already in residence, but so far so good. Now I know what you’re thinking… why have you named the pigs? It just makes it harder for them to leave. Well, they may not be leaving. These two are so much tamer than any others we have had before and so we don’t know if they are staying or going, but needless to say we have already made enquiries about sourcing an alternative pig for the wedding hog roast in June. Oh dear. Sometimes I wish I had used my hands a lot more doing manual jobs through my life, to get my hands toughened up for the rigours they are now put through. Cracked hands, that’s the problem. I have tried a number of different ways to sort the issue out, from wearing gloves, to using a bucket load of different hand creams to try and resolve the problem. I need to sort it soon, because however much I moan, there isn’t any sympathy given around this neck of the woods for a farm hand with soft palms.